Not showing the dead pity, O the error! They lived during the reign of Emperor Maximian (286-305), having as their homeland the city of Gangra, in the province of Galatia. Their parents were pagan Greeks, whose names were Philotheos and Eusebia; their father was from the land of the Galatians, and their mother was from Nicomedia. Eustathios occupied himself with his studies, while Thespesios and Anatolios took up the occupation of their father, which was the selling of clothes. 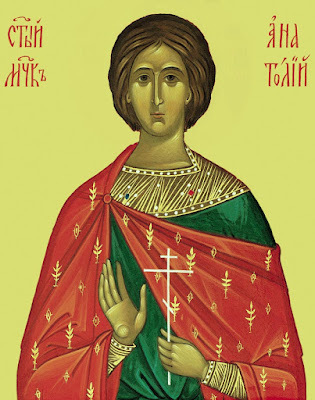 Their father Philotheos, coming one day from the East to Nicomedia together with Anatolios, was taught about the faith of Christ by their fellow traveler Lucian the Presbyter and teacher (Oct. 25). Having persuaded his son also to his teachings, they believed in Christ and were baptized. When Eustathios and Thespesios were going to Nicomedia, they met the blessed Bishop Anthimos of Nicomedia (Sept. 3). Having been taught the faith of Christ by him, they also were baptized. Later their father Philotheos was ordained a Presbyter, and Eustathios was ordained a Deacon. Not a long time had passed and the parents of the Saints died. They were then accused before Maximian of being Christians. Thus they were beaten with drum sticks, then cast into prison. There a divine Angel loosed them from their bonds. Being unbound, they ate and drank. The next day, they were delivered over to the wild beasts. Having wrestled with them, they remained unharmed. Anthony the count then brought them to Nicaea, and he tortured them with many punishments. He suspended them on wood, and they were so inhumanely scraped with iron claws, that the entire ground became red with blood. They were then cast into prison. An Angel again appeared to them, and liberated them from the pains of their wounds, restoring health to their bodies. When the blood-sucker beheld these things, he ordered for the beheading of the Martyrs. When the Saints came to the place where they were to meet their end, they immediately delivered their souls into the hands of God, and received the crowns of martyrdom. This made the executioners fear that the tyrant would punish them, because they did not fulfill his orders, therefore they took the dead bodies of the Saints, and cut off their honorable heads.